Experience - and common sense - tells us that the better birds are cared for, the better the quality and flavour of the chicken they produce. All of our chicken comes from a group of carefully selected British farmers and suppliers who have worked with us for several years. They understand and share our values and our commitment to rearing our birds to the highest standards of quality and animal welfare. Please remember not to wash raw chicken as the splashing water can spread campylobacter. Cooking your chicken thoroughly kills this bacteria. 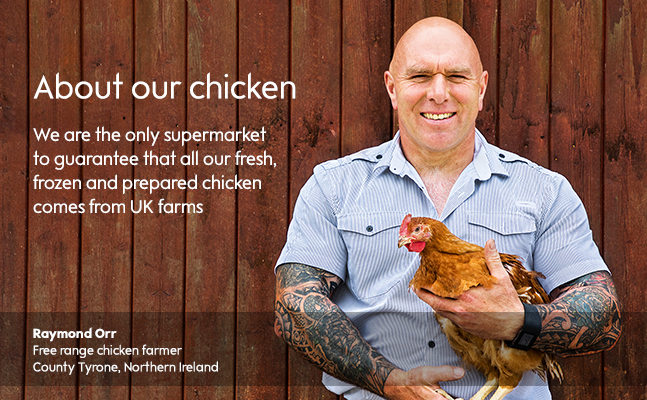 Chicken in the "Essential Waitrose" range is produced by farmers who have worked exclusively for Waitrose for several years. They understand the importance of quality standards in producing succulent chicken. They also feel as passionately as we do about standards of animal welfare. Birds are fed a diet enriched with maize which gives excellent eating quality, and are reared in purpose-built houses with large windows down each side to allow the natural light to stream in. They also have straw bales to play with to keep them fit and active. The hens have 20 per cent more space than the industry standard, giving our birds the room they need to move freely. These standards meet the RSPCA's recommendations for stocking density and have the support of other key organisations such as Compassion In World Farming (CIWF) (this link opens a new window). Our free range birds have unrestricted access to pasture during the day where they can forage and range. Chickens are descended from jungle fowl that naturally live in the undergrowth so we provide cover and shelters to make them feel protected and secure. At night they return to their houses for protection against predators. Free range birds are reared for longer, and the combination of the outdoor life and a balanced diet all help to ensure succulence and flavour, and a firmer texture. To learn more see the video on this page. This delicious and richly flavoured bird has a characteristically golden colour to the flesh, which comes from its maize based diet. The hens are reared in the same way as our other free range birds. against predators. The organic farms are regularly and independently audited by Organic Farmers and Growers. Waitrose & Partners are signatories of the 2026 European Chicken Commitment, pledging to play a leading role in improving the welfare of farmed chickens. Under this commitment, Waitrose & Partners has pledged that all fresh and frozen chicken, and all chicken meat ingredients, including ambient, across all Waitrose own-brand products will meet the requirements of the pledge by 2026. Waitrose & Partners already meets the vast majority requirements of the pledge, including stocking density, for all its fresh and frozen own label chicken. However, working alongside Compassion in World Farming and our long term poultry supplier and research partner Moy Park, we are pleased to help lead research into new breed requirements that will drive forward the welfare of all farmed chickens. Full details are on our animal welfare page. Whilst all our chicken is protected from Salmonella it is good practice to follow Food Standards Agency guidelines and cook all chicken thoroughly until the juices run clear when pierced with a fork. To prepare chicken, before cooking, remove all packaging. Wash all work surfaces, cutting boards, utensils and hands thoroughly after touching raw meat. Do not reheat cooked chicken once cooled. The results of our campylobacter survey for the fourth quarter of 2018 (October to December 2018), published today, Thursday 13th March 2019, shows that Waitrose had 5% of chickens testing positive for levels of campylobacter >1000 cfu/g (colony forming units) over the period. This is the sixth quarter of data to be published under the latest FSA rules that place responsibility for campylobacter surveillance and data publication on supermarkets themselves. We have been robust in our data gathering and analysis, surveying chicken both at factory and on supermarket shelf. Waitrose takes its commitment to reducing Campylobacter very seriously and is a long-term supporter of the Food Standards Agency’s (FSA) efforts to eradicate the organism from the poultry supply chain. We only source our chicken from carefully selected UK family farms that we know and trust and we continue to work hard to ensure that the poultry they supply are raised in the very best welfare conditions at low stocking densities. In partnership with our processor, we have developed a cutting edge end to end process to reduce Campylobacter in our supply chain. We have installed an industry-leading ‘double barrier’ enhanced bio-secure system on all of our poultry farms. Our strategy has been holistic in terms of biosecurity before, during and after the rearing cycle to minimise the risk of Campylobacter colonisation of our birds. In addition, we have trained all our farmers and catching teams in biosecurity measures and installed communication boards in all our poultry houses, further enforcing communication and industry-leading bio-security practices. All farms are audited every crop cycle by a central audit team to monitor compliance. We regularly monitor compliance in this area. Through a non-invasive method of on farm testing we have found that increasing the number of days between ‘thin’ (when a proportion of birds are removed from the flock) and ‘clear’ (when the whole flock is taken from the poultry house for processing) increases the risk of Campylobacter colonisation at higher levels. Our investigations have shown that there are lower levels of Campylobacter in chickens that live in fan ventilated, steel-framed houses that are less than 15 years old; the vast majority of our farms have broiler houses that are less than 10 years old. Further to this, all our new supply farms comply with our ‘farms of the future’ standards. Our ‘farm of the future’ project involves work around ensuring we source chicken from the most forward thinking suppliers in terms of investment in new, cleaner buildings, drinkers, heating systems, farm access management, data capture, litter management and bird welfare standards. Our farmers and their teams receive regular training to ensure they operate to the very highest hygiene standards. Hygiene best-practice information boards have been put in place at all our supplying farms. There is some evidence to suggest that drier heating systems such as indirect heating sources / hot water heating systems can reduce the prevalence of Campylobacter. However, research in his area is still at an early stage and we are using global benchmarking and on-going data analysis to determine the impact this could have. Biomass and indirect heating systems have been installed across our supplying farms. We are working with researchers from the UK and internationally to share best practice in areas that we believe will bring significant benefit including improved management of water drinkers on farm and improved management of the environment in our chicken houses. Our supply facilities operate to the highest hygiene standards and have optimised procedures including lairage, module crate washing and inside/outside washer efficacy. We remove the neck flap from processed birds as our research suggests that this is an area where Campylobacter may become concentrated. Process flow changes have been implemented in the packing areas of all our supply factories to segregate unsealed and sealed packs. This minimises the possibility of Campylobacter being transferred to the outside of packs. We have a range of oven ready birds sold in a ‘ready to roast bag’ which are ideal for customers who would rather not handle raw chicken – we were pioneers of this approach. 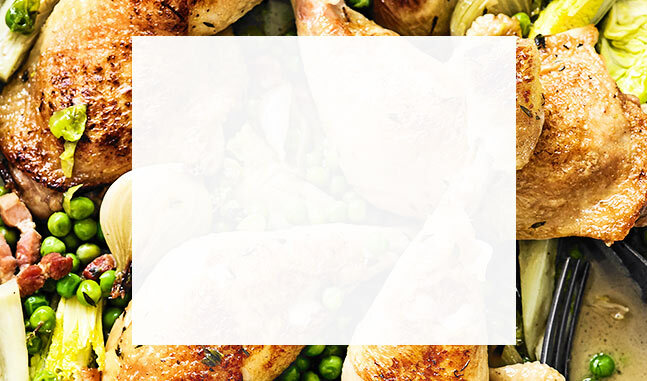 We have communicated the safe handling of chicken message in-store, on pack and through our marketing channels including Channel 4’s Weekend Kitchen with Waitrose programme; Waitrose Weekend and Waitrose Food publications, on our website and across social media. We will continue to highlight the best ways of handling raw chicken. We run our own in-house Campylobacter workshops with Professor Chris Elliot - a leading expert on food safety – and representatives from the FSA. We believe that our extensive action plan has driven our success in driving down Campylobacter levels in our chicken from farm to kitchen.